Despite a substantial investment in the development of panels of single nucleotide polymorphism (SNP) markers, the simple sequence repeat (SSR) technology with a limited multiplexing capability remains a standard, even for applications requiring whole-genome information. Diversity arrays technology (DArT) types hundreds to thousands of genomic loci in parallel, as previously demonstrated in a number diploid plant species. Here we show that DArT performs similarly well for the hexaploid genome of bread wheat (Triticum aestivum L.). The methodology previously used to generate DArT fingerprints of barley also generated a large number of high-quality markers in wheat (99.8% allele-calling concordance and approximately 95% call rate). The genetic relationships among bread wheat cultivars revealed by DArT coincided with knowledge generated with other methods, and even closely related cultivars could be distinguished. 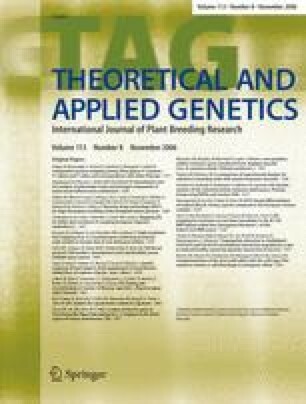 To verify the Mendelian behaviour of DArT markers, we typed a set of 90 Cranbrook × Halberd doubled haploid lines for which a framework (FW) map comprising a total of 339 SSR, restriction fragment length polymorphism (RFLP) and amplified fragment length polymorphism (AFLP) markers was available. We added an equal number of DArT markers to this data set and also incorporated 71 sequence tagged microsatellite (STM) markers. A comparison of logarithm of the odds (LOD) scores, call rates and the degree of genome coverage indicated that the quality and information content of the DArT data set was comparable to that of the combined SSR/RFLP/AFLP data set of the FW map. Supplementary material is available in the online version of this article at http://dx.doi.org/10.1007/s00122-006-0365-4 and is accessible for authorized users. We thank the Australian Grains Research and Development Cooperation (GRDC; www.grdc.com.au) for financial support. Triticarte P/L (www.triticarte.com) is a joint venture of Diversity Arrays Technology P/L (DArT P/L; www.DiversityArrays.com) and the Value Added Wheat Cooperative Research Centre (VAWCRC; www.wheat-research.com.au). The Triticarte/DArT team thank their colleagues at CAMBIA (www.cambia.org) for their friendship and collaborative spirit as well as many interesting discussions during the period when CAMBIA was sharing laboratory facilities with Triticarte/DArT. We also thank two anonymous reviewers for their detailed comments, which have helped to improve the manuscript.